Finding a reputable and high quality vehicle repair facility is easy when you choose Pfaff Autoworks at 214 Courtland Avenue in Vaughan. We are an automotive collision repair facility that services all makes and models of vehicles and if you are looking for a mechanic in Vaughan, then you have come to the right place! Pfaff Autoworks is a division of Pfaff Automotive Partners, an Ontario based automotive dealer-group that retails the Audi, Porsche, BMW, Toyota and Volkswagen brands. 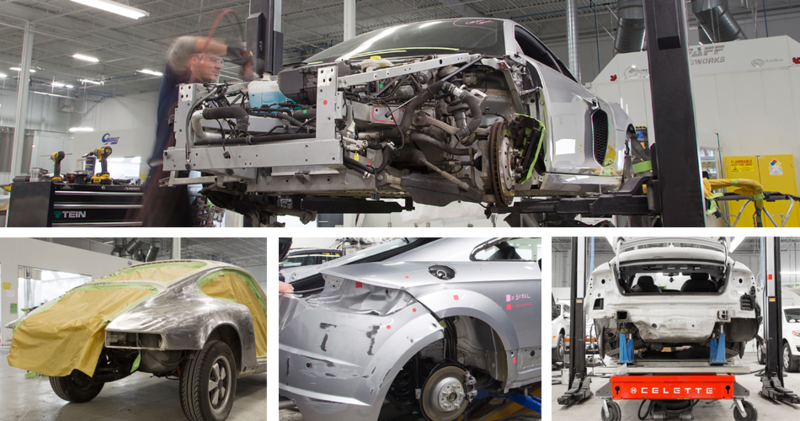 However, our vehicle collision repair facility is capable of servicing all makes and models. Our Pfaff Autoworks facility has a large variety of equipment and machinery like in-house hoists, tire machines, and many other key pieces of equipment. As a quality mechanic and repair shop in Vaughan, having this equipment means that we have the ability to perform many services, which in turn result in quicker repair times and a higher quality of results! At Pfaff Autoworks, we also offer a service called Express Repair Service. If you have been in a minor collision or you need to have a dent or scrape pulled or buffed out etc, our Express Repair Service can have your vehicle repaired in 3 days or less (please contact us for exact timing). We understand that it is rather inconvenient having to get your car repaired at a mechanic in Vaughan, and it is for this reason that Pfaff Autoworks takes great pride in our Express Repair Service. Our customers will get their vehicles back quickly and with the highest quality results! For more information about Pfaff Autoworks and why we consider ourselves to be a top quality mechanic in Vaughan, please feel free to continue browsing through our website. We can also be reached at (866)674-3927 or by filling out our contact form.